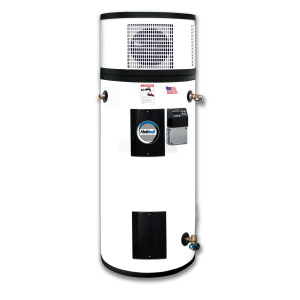 Hubbell heat pumps from PBX series are the ultra-efficient electric water heaters that use the heat pump technology to heat water and the electric elements as a backup. This air-to-water type heater utilizes the surrounding air to pull the heat from and transfer it to the potable water stored in the heater’s tank. This is the way of heating is much more efficient, than the traditional approach with the immersion heaters. The water heater operates with the maximum efficiency when the temperature of the surrounding air is high, but when it is cold, the efficiency decreases significantly. The minimum temperature that allows Hubbell heat pumps to provide at least some energy to water is approximately 40 F, and in a case when there is not enough heat to meet the demand for hot water, the backup electric elements are used. Hubbell heat pumps work as other heat pumps mentioned here, similar to Rheem, AO Smith and other, while it incorporates some unique features that are more powerful than features found on other units. While Rheem, AO Smith, GE… have only one or two sizes available, Hubbell manufacturer offers five models, available in sizes; 40, 50, 65, 80 and 119 gallons. Economy mode does not engage the electric heating elements for water heating, while all the power is coming from the heat pump, so all the produced heat cost you the least. Hybrid mode is the default mode when the water heater mainly uses the heat pump, and if the high demand has to be met, it turns on the electric elements, therefore providing more power for heating, or it balances the power for better efficiency. Electric mode is the mode when the heat pump is not used and is the least efficient mode. The unit works like the conventional water heater utilizing the upper and lower heating elements. Superheating mode allows both technologies to work at the same time to provide the highest recovery rate for the unit. It is recommended during the peak time when more family members or appliances are using hot water at the same time and if the fast recovery is needed. The use of the “Max Heat” button also allows you to put the heater into this mode, but temporarily. Vacation mode is recommended when you are on vacation or during the extended stay away from home. It allows you to set the number of days that can be from 2 to 99 days, and in this period the water heater turns on only when there is a danger of the freezing temperatures. Therefore, the unit will be protected, and it will resume its previous heating mode when it reaches the end of the set date or number of days. Another benefit, except the freezing protection, is, of course, the energy conservation when the unit is not used. As said before, the heat pump technology is what makes these heat pumps very efficient, but also the 3” thick foam insulation that is reducing the standby heat loss from water through the heater’s wall, and the heat traps. The maximum efficiency of the Hubbell heat pumps is 2.33 (with the air temperature of 70 F). With the surrounding air of 90 F, the energy factor can even rise to 3.07. Hubbell guaranties the long life of its heat pumps, less inspection, and maintenance, mainly because of the unique features such as the Hydrastone cement lining, a coating that is thicker and denser and covers the whole inner surface of the metal tank, which is not the case with the glass lining. Hubbell guarantees that the Hydrastone cement lining consistently covers the whole inner surface of the tank. With such a superior feature, there is no need for the sacrificial anode rod, so it is not incorporated in the design. Another element that reduces the risk of corrosion is the tank tapings that are made of the solid non-ferrous copper and silicon. The heaters use the Incoloy sheathed electric heating elements, rated 3800 Watts each. They provide a long life mainly because of its resistance to the aggressive water action, which can lead to corrosion and sediment build-up. The unit has the noise level of 62 dB but with the two-stage fan the noise can be lowered, efficiency-optimized and air flow reduced if needed. The units feature the electronic controller, so the control and monitoring of the water heating parameters are much easier and hassle-free, including the diagnostics. There is also the audible and visual error indication that makes the use of the heater even more convenient for its users. The temperature can be set between 50 F and 160 F, where the unit is protected from overheating utilizing the high limit switch that reacts when the temperature of hot water reaches 190 F and a manual reset. Hubbell manufacturer provides a 10-year warranty on tanks and 6 years on other parts and recommends the heat pumps for the residential applications, also light commercial such as restaurants and schools. For detailed information and manuals click here.